This year #GivingTuesday is December 1st…And now it is also #GivingFriendsDay! The #GivingTuesday movement has inspired giving around the world, resulting in greater donations, volunteer hours, and activities that bring about real change in communities like YOURS! On the heels of this success, Walk With Sally has created #GivingFriendsDay. On December 1st we’ll make this a day of giving back by raising FUNDS and FRIENDS for children impacted by cancer! 1 in 4 people diagnosed with cancer this year will be a parent. 1 in 5 of these children will experience the death of a parent from cancer. 25% of all these children will experience lowered or anxious moods, sleep problems, poor concentration, or difficulties at school and in worst-case scenarios, severe profound trauma. Walk With Sally helps by giving these children an advocate for healing, someone who has walked in their shoes. By fostering trusting and loving relationships between children and their mentors, Walk With Sally creates an environment that allows them to help each other heal from the devastating effects that cancer can have on us all. Luis lost his mother to a very aggressive form of Cancer. They were very close and those 14 years he took care of her while she battled the disease are always present in his mind. Luis was matched with Brian last month. Brian’s mother is in remission from Breast Cancer. The family has had to downsize and relocate and it has caused Brian to become withdrawn, shy, sad, and his mother has noticed he was begining to act out a bit. Brian’s mother recently told Walk With Sally she’s is so relieved that he has a friend in Luis that can help him heal and just be a kid for a while. This is just one example of how important raising funds can be to kids like Brian. By donating, you can help Walk With Sally make a real difference in a young person’s life. Pledge to fundraise an amount through your family, friends or colleagues. For example, 10 friends giving $25 raises a quick $250 for a Friendship like Luis and Brian. We need MENTORS! 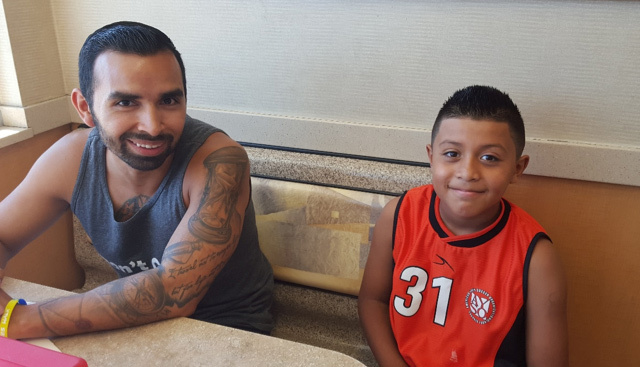 Mentors like Luis are people who have been touched by cancer and are ready to give back. Use your network of friends, family and colleagues to help us find future Mentors. Use Facebook, LinkedIn and Twitter to help spread the word and send them back to us! Use our WHY MENTOR link on our website. Pass it on and be a champion! Be creative! Take a selfie with a sign saying: #GivingFriendsDay. Looking for people who have been touched by cancer and want to give back. Children Impacted By Cancer Need You NOW. Become a Mentor with Walk With Sally!”and post it everywhere. Nearly 18 million children in America need or want mentoring, but only three million are in formal, high-quality mentoring relationships. Help Us Help Children impacted by Cancer by giving them the mentor they want and need! This entry was posted in Fundraising, Giving Tuesday. Bookmark the permalink.